The double anniversary for Mamou and Mamou too last July 21, 2012 was a huge success despite the pouring rains that day. As a result, the wonderful owners, management and staff of Mamou have donated the entire day’s proceeds and all service charges to the marketmanila.com sponsored feeding programs for undernourished public school children. Over the next 8 months or so, roughly 15,000 FULL MEALS will be provided to students at schools in Taguig and Cebu! Such incredible generosity, for five years running now, and the kids are truly, truly grateful. I would like to thank all of the folks who had lunch and dinner at Mamou on July 21st, and who ate heartily to help the kids. A huge thanks to Mamou’s owners, managers and staff as well. It is appropriate that the feeding programs start this week, after the deluge and floods that hit last week. I was tempted to apply some of the feeding programs funds to emergency food assistance for flood victims… but decided to stay the course in this sustained year round feeding program that benefits the kids throughout the academic year. Maraming, maraming salamat! P.S. Red Velvet Birthday cupcakes by Sonja’s Cupcakes. Am sure the feeding program will put a lot of smiles on the kids’ faces and would fill a lot of tummies. 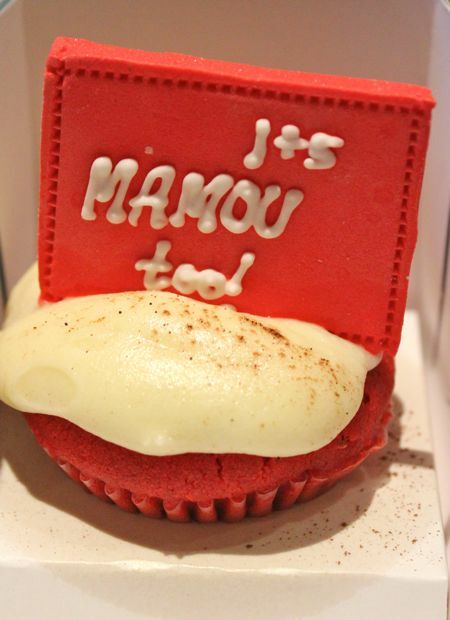 Congratulations to Mamou and to you, MM. May your tribe increase! blessings to you all for your generosity, and so that you may have more to share! Yum, yum, yum… and this morning I was craving for muffins… pero ang flavor na naruon sa Starbucks store eh double chocolate, flaxseed, vanilla… kaya hindi ako bumili. And now I see this red velvet cake.. ay naku kung meron sila non, dalawa agad binili ko. Thank you Mamou and staff for your generosity! And a double THANK YOU to MM and family for continuosly spearheading this effort of love! Thank you for your generosity Mamou management and staff. You will be blessed a thousand times… May your tribe increase! Prisoner in Paris Terminal E! Have a Great Trip, Apicio!